Soil Stabilizing - cfm - Wisconsin supplier of Erosion Control Products, Straw Blankets, Geotextiles, Silt Fence, Drain Tile, Polymer, Silt Sock,Gabions, and more! 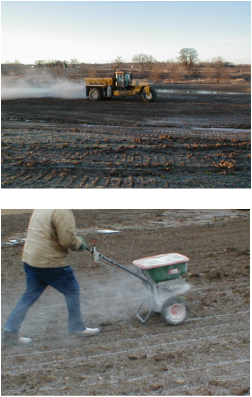 CF2000 is a low cost, highly effective tool for reducing soil erosion (caused by wind and water) by chemically bonding soil aggregates. The CF2000 clumps together silts and clay (generally particles less than 20 microns) and prevents them from being detached and suspended in rain water runoff. The soil structure is preserved, resulting in less erosion and greater infiltration of water. CF2000 is intended to reduce the erodibility of bare soils during construction activities and to improve the performance of mulching on permanent slopes. CF2000 is environmentally safe and harmless to fish, wildlife, and plants, when applied according to manufacturer’s recommended rate. Greater use of this product lies in its ability to button up a project for winter when it is too late for vegetation to be established.